I realized I could not stand in my wifes way and that God was all I had left (no children, a new mortgage which I would never be able to pay off) God answered my prayers of double mindedness and fear. I learned to be content with Him and not be ruled by my emotions, circumstances or others. I learned to seek Him in this day (not tomorrow) and to live each day to the fullest as He guided me and my tasks. I learned to praise Him with (in my tears) with my words, actions.... with my sacrifise of praise. Again, He answered MY life long prayers of double mindedness and fear through this dark valley of seperation. Not in the way I wanted to happen. That while in His crucible, He burned off all the dark secrets and filth in my life. That while still in my tears, I could sow seeds of faith and that one day I would reap sheaves of joy and have an answer as to why. That what satan meant to harm me, He turned it into greater joy. That His ways and thoughts are so far above mine, that what I could not imagine, what He had already done ... for me, a wretched sinner. That He so loves me, my wife, our families, the stranger, the sinner, the lost, the lonely, that He will NOT leave us. My wife returned a Prv. 31 woman, with a hunger for the Lord, His wod and His ways. She is not the woman I married, she is much more than I could have ever imagined. I am also a very changed man. That even when I gave up, He did not and will not. That He is no respecter of persons, that He will go to the ends of the earth to rescue you, your wife, your children . Be strong the LORD is GREAT,He ear our prayers,HE show HIS Face to whom who sought HIM wholeheartedly.nothing is impossible to HIM and we shouldn't be a lukewarm christians. My friend Brice explained to me that he had been given two books—A Wise Man and How God Will Restore your Marriage. He told me about the internet site for men Encouraging Men and he directed me to find it. I told him that I only wanted to read what was true about divorce and marriage from the bible. He quickly explained that the books were not commentaries about marriage, but rather, roadmaps to the relevant scriptures throughout the bible. Every question I asked Brice, he always answered with scripture just the way your books do. Jesus did the same thing when he was tempted on the mountain. Jesus had replied to Satan’s temptation three times with “It is written…” Matt 4:5–10 NKJV. Brice described his situation with his wife and how their separation had happened. Every time I talked to Brice, he always spoke positively and was upbeat about his wife’s return. And he also talked about how we would all go to Applebee’s for a chocolate shake when my wife returned! All I could think of was how hurt Brice was going to be in the end when it didn't happen. Brice experienced a restored marriage with his wife. His wife had moved back to their home! Unfortunately he never wrote it down, much like so many others who experience a restored marriage, most don't take the time to share it. My wife and I remarried. My wife now has a new relationship with Jesus Christ and it is because of our Lord and Savior, Jesus Christ in what He helped me come through. Even though I did have to sell our small ranch, I now manage a much larger ranch that came with a very nice home. My daughter is married and expecting their first child. My youngest son is now in college. My wife teaches 2nd grade now and is anxious to be a grandmother. Another book that was blessing in my life and opened my eyes to many other mistakes I had not even noticed, but I committed in my marriage. God is wonderful and is acting on my behalf, is blessing me greatly, today I can see how much I messed up and be sure that He will give me a second chance to be a man, a husband after the heart of God, following his word! It helped me to see the principles and practice it but I need God's help in everything. This book was so informative. Almost every chapter was like it was talking about me and what I wasn't doing properly. This book challenged me and encouraged me to get right with God and be that husband that God intended me to be and showed me the areas in my life that I needed to fix by Gods grace and help as well as be able to share with others what I am learning. It has helped me to understand obedience in Gods will, for God knows what is truly best for me. Doubt and fear can invade the mind and remove any faith you have in circumstances, leading to destruction. I understand I must follow the narrow gate and not the wide gate of destruction. I have learned that I must be the spiritual leader in the household. "A Wise Man helped me become a DOER and not just a hearer of the word. Unlike all the so-called "experts," Erin's materials acted like a compass, constantly pointing me back to the truth of God's Word. The book pointed me to the only Counselor who could help me: God, through his Holy Word, the Bible. The book's unique approach and easy readability helped me to work through my Bible in a way I'd never done before. Ultimately, it was God's Word that brought the conviction that I'd built my marriage on sinking sand, and that I needed to seek God with all my heart for His forgiveness. A Wise Man "works" because it is not based on man's wisdom - it's almost all Scripture, AND it refreshingly goes a step further and teaches the practical application of that Scripture. God gets all the credit, as He should. God used Restore Ministries to point me to His Word and draw me closer to Him during my time of trial, and I thank Him for His mercy. 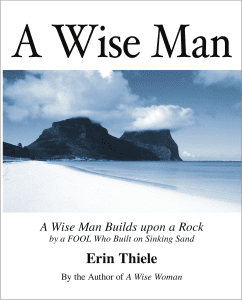 If you want to avoid the major problems that plague most marriages these days, buy A Wise Man - you won't regret it!" 1. Pulling God's Word out in the area of marriage and divorce. 2. Because it was written by someone who has gone through this and fruit. 3. To learn God's game plan for how to deal/why this is happening. 4. A good explanation of how suffering is one way God teaches obedience.